Out shopping today and Tia saw broccoli and had to have it.. she even couldnt resist trying to eat some of it raw?! She usually will have it when we order chinese.. as both hubby and I detest broccoli (we call them 'trees'). Altho my mother-in-law once made a awesome creamy cheese broccoli and cauliflower bake-ish thing.. and i loved it.. however i havent liked cauliflower or broccoli since then.. I don't boil any of my vegies usually.. unless it's potatoes for mashed potatoes. I always steam.. for maximum vitamin retention and to retain the best 'eating texture'. 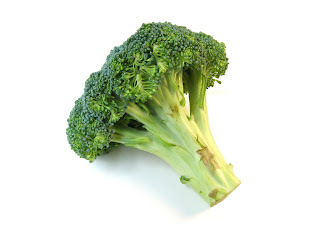 Cooked broccoli shouldn't be soft and floppy..but have a little 'bite' to it, not overly crunchy. Then again.. it's each to his own re: taste. My inlaws just boil everything until it's soft.. just a mush and that's how they like it. A lady from our church insisted once that I soak broccoli before cooking because it's sprayed 3 times (as in pesticides). I can attest to that as I used to cut broccoli on a farm (and yes, eat it raw..more the stems though.. not the green flowery bits which would just stick in your teeth like coarse ground pepper). That church lady soaks her broccoli in 3 different batches of water. I usually avoid frozen broccoli too for the most part as it just doesn't have the same taste or texture as freshly steamed broccoli.. but when I'm in a hurry.. it's usually frozen, slippery bok choy I'll avoid more when frozen. Because I've cut broccoli before, I know which are the right one's to buy and which to reject (and the farm I worked on sold broccoli to Coles supermarkets). Small, tightly packed 'heads' are the go.. not loose..bigger leaved tree's! And no yellow flowers or purple-shades on top (ie. old stuff). Friends in the 90's steamed their broccoli and would squeeze lemon on afterwards.. And we've done this and enjoy it. But moreso if butter is melted on first! We don't do the butter thing now though. I'm so glad Tia likes broccoli! Toasted sesame seeds sprinkled on after the lemon is something else we like.. or a combo of lemon/soy. Maybe I'm going overboard here.. as children usually just enjoy simple flavours! gosh some people are so slow!!! oh im a smartie.. i just knew it..